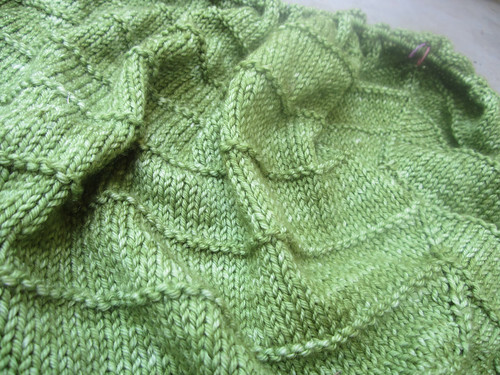 Some of you may recall that in the past I occasionally shared my knitting progress with you. Then came the knitting slump, in which knitting reports became fewer and farther between than even more sporadic posts became. Well, posting is still less often than /I wish it was but today I have a little bit of knitting to share. I know what part of the problem is. I know why the slump in my knitting. I don’t tend to knit unless I am watching something. I have gotten out of the habit of turning on a video or movie in the evening before I get out my reading, so that’s the where the knitting went. I have been reading a lot more though. I know I could listen to audiobooks and knit. I have done that but I tend to prefer to listen to books while driving rather than while knitting. I don’t know why that is. It just is. So anyway, I showed you that I finished the small Sorrel in my last post in Michigan last week but it was fresh off the needles and still unblocked. I have now washed it, blocked it and added the button at the back neck, so it is officially done! I am pleased with the pattern and the result. I see this as a garment that will grow with the baby. There are three sizes and I could see using either the small or the medium for a newborn. It should fit for awhile progressing from a dress/tunic type garment to a t-shirt later on. The medium would fit longer I suppose and be roomier at the beginning. So, if I was assuming a small baby I might go for the small but choose the medium for a 9+ pounder or something. Make sense? 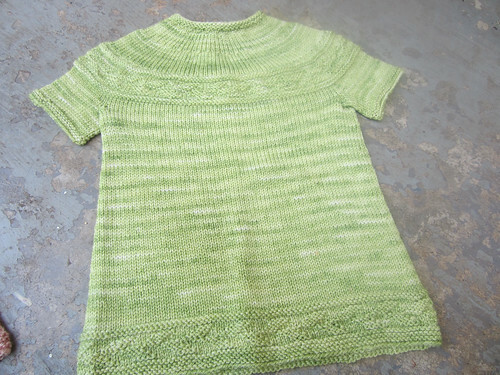 I would make the large if I was making this for a baby older than say 3-6 months and also expect it to fit for awhile. Well that’s all the knitting for this week. 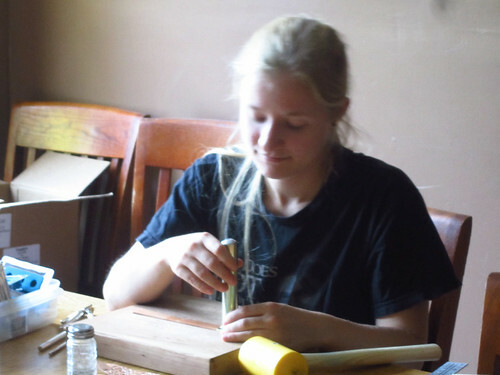 I will close with a picture of Meredith working on a new product that she hopes to have available for debut at the Wisconsin Sheep & Wool coming up early next month. I will give you a hint. It’s made from leather and you wear it on your arm. More pictures of these next time!